Sunny, breezy, top floor studio with balcony, less than 100 metres to Bondi Beach! Ever dreamed of waking up to uninterrupted sunlight gently filtering in, as you luxuriate in the hotel quality sheets on your four poster bed? Of stepping outside to find a variety of specialty cafes offering tempting breakfasts and excellent coffee, before wandering down to the beach? Spend your days at Ruby’s Oasis exploring what Bondi has to offer. The Bondi to Bronte coastal walk starts at the Bondi Icebergs, where you can also swim laps in the ocean pool, or relax in their sauna that looks out over the water. Discover the airy yoga studios, cafes, and restaurants, boutique shops and mini galleries before sampling the delicious drinks and live music on offer at one of the many vibrant bars that open their doors at sunset. A luxury beachside lifestyle, plus easy public transport to the CBD! Featuring a sunlit balcony, this renovated studio comes with a beautiful, four poster queen size bed, fully equipped kitchen including microwave and dishwasher, and an enviable location. Secure lock up parking available for separate hire. Shared coin operated laundry facilities (wash+dry) just down the hall. Minimum stay 4 nights. Stays of 20+ nights come with complimentary fortnightly cleaner. NO UNDER 30 YEAR OLDS PLEASE. to $200 AUD per night for last minute 2-3 night stays. Security deposit payable 7 days prior to arrival: $750 AUD. * PLEASE NOTE: headroom in the garage is only 1750mm high (which is quite low). Does not fit a van or perhaps a 4WD. Garage is lockable and in a security car park under building. Julie, Feb 2019 - "Great home and location within Bondi - highly recommend!" Elaine S., July 2018 "Had a very good stay. Lovely light place in a great street and close to all the action. Everything comfortable. Great to have a dishwasher. Could have had a bigger bath sheet and more sheets as I stayed for longer and washing was a big of a fag. Having to find the dollars and get a space in the queue. But everything else great. The loud music was infrequent. There were quite a few parties at night at weekends but that is to be expected in Bondi and I can sleep though anything. IGA handy. The bars are all very cute and I had so many places to choose to eat in from a wonderful handmade dumpling place to a good wholefood shop to a cosy bar called Speakeasy. Got lots of work done and enjoyed blowing the cobwebs away walking to Bronte and Coogee. Thanks "
Avi, April, 2018 "The property was really comfortable and met our needs. Using the toaster set off the smoke detector so it may need to be cleaned or replaced. Written instructions for the oven would be helpful. The place was delightful and perfectly located. Overall we had a great time in Sydney! " Jae - Cosy studio centrally located in the heart of Bondi. Five minute walks to everything you need - shops, restaurants, beach and nightlife. The interior of the block is a little unloved but once inside the apartment it is clean and secure - with a very very comfy bed. Deborah responded quickly to any queries and solved issues - what you need in a good host. Perfect located apartment, nice size for a week or weekend away. Kevin - Ruby's Oasis by the Beach is the bomb! VERY close to beach, all amenities you'll need, very cool location with great food all around. I would definitely recommend it. Plan ahead if you bring a car, parking is a bit tough /expensive. Danelle - This was a perfect space! Clean, comfortable, and everything I could have needed. So close to the beach and walking distance to everything. Thank you so very much! Marina - This little flat is adorable! Perfect location and perfect for a Bondi getaway. It's truly a studio so could be tight for extended periods of time for more than one person but great for a weekend away. Rita Maria - The stay was great. Everything worked as expected and Deborah was very easely acessible in case of need. The appartment is confortable and had everything we need . It is very well located. Thanks Deborah.. Hope to come back! Response from Deborah:Thank you for your lovely feedback Veronika. I am very glad you enjoy your stays, and perhaps I will see you next time you come! Vielen Dank für Ihr Feedback schönen Veronika. Ich bin sehr froh, Ihnen einen angenehmen Aufenthalt, und vielleicht werde ich bis zum nächsten Mal, wenn Sie kommen! Adam - Debbie was a great host with excellent and quick communication. The place on Bondi Beach is fantastic: it has everything you need for your stay, close to the shops and great cafes and bars, and only 400m from the actual Bondi Beach. Fantastic place and would definitely return! Coffee in the fridge and chocolate from Rose was a very nice touch. Debbie also was really attentive and fixed the air con whilst we were there, and provided a fan for the interim. Really great experience! Thank you! Fantastic location, neat and tidy apartment with everything I needed, recently renovated with beautiful finishes, cozy, corner unit so not much noise from other units, nice little north facing sunny balcony, very easy going land lady ! Deborah was so helpful and made everything even better. What more could you ask for really? Very pleasant stay at a beautiful, clean and ideally located apartment. We really enjoyed our two weeks at Bondi - which was made better knowing we had a great place to stay. Very comfy bed, lovely decor with an immaculate kitchen and bathroom. Thank you. We really enjoyed our stay in Ruby's Oasis, it had everything we needed for a very comfortable stay, and was situated in an excellent position to enjoy Bondi Beach and Sydney. Lovely studio in a great location, and exactly as pictured! 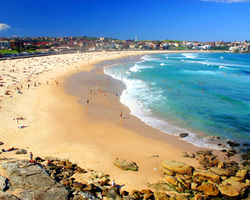 I wouldn't hesitate to recommend Ruby's Oasis to any family or friends for their stay in Bondi Beach. I can imagine I will be back myself! Thanks so much. Deb, thanks for a great stay. The set up is perfect for my work-on-the-beach stay. I really appreciate how you have set this up, from the furniture to the linen. I'll be recommending this place, and if I come back, I'll be sure to stay. Great place and very well equipped with all you need. (T and M, the front door handle is being replaced!).. Debs, this lovely "beach oasis" is a perfect holiday home, beautifully decorated (in a block of apartments that are a little 'old'), it has all the wonderful necessities. Appreciate the quality linen and the good decor, even the bamboo that softens the brick wall. We had a lovely stay! Thank you for a very enjoyable stay at Ruby's oasis we had an amazing time. Your place is beautifully decorated and very comfortable not to mention we had everything on our doorstep, brilliant location. Dear Deborah, My parents were EXTREMELY pleased with their stay at RUBY's OASIS BONDI BEACH, not only was the location perfect and the apartment itself a true Oasis, but we were above all impressed with the level of customer services that we experienced from you and Derek - from the early check in and late check out to coming to the rescue late at night when the right key was inside the apartment....nothing was ever too much and everything was done with urgency and smile. Impressive. We would definitely recommend your properties and book you again. We found this studio apartment to be the perfect choice for us while staying in Bondi. The location is excellent - close to beach, restaurants/cafes and shops. The recently renovated interior is really tasteful and the north facing balcony - drenched in sunlight all day - which was a big plus for us. We found the owner to be very friendly and helpful. We'd definitely book this place again if we ever return.